It's been some time since I posted, so I thought it was about time I did. This is to say thanks to everyone for making it a great AGM. Lots of fun times and rides had by all I hope. I hope all enjoyed my attempt at leading a ride. Sorry about the bumps George, hope the back gets better real soon. The main reason though for this thread is to say to all I made it home ok. I had less distance to travel than all others (being from Sydney). Hoping all also make it home with no mishaps, only further adventures. 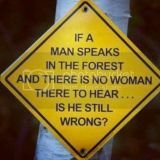 If a man says something in a forest, and no woman is there to hear him. Is he still wrong? Even local government want to know. Thanks Gonzo, The Vic's made it home with no drama, had a good time thanks to all involved.